Posted on Mon, Apr 2, 2012 : 12:20 p.m.
Ann Arbor firefighters responded to fire that damaged a detached garage, fence and a newly installed hot tub behind a home just before noon Monday. 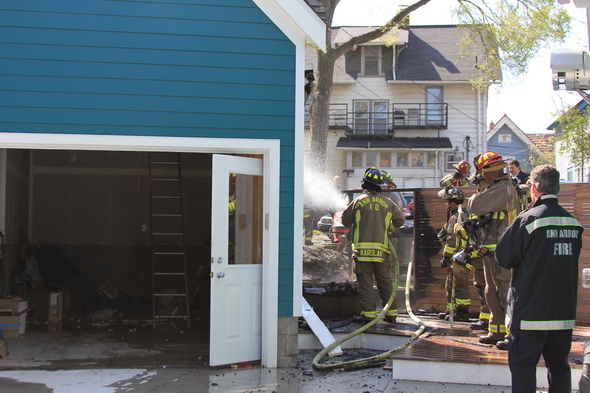 Ann Arbor firefighters extinguished a blaze that damaged a detached garage, fence and a newly installed hot tub behind a home just before noon Monday. Battalion Chief Robert Vogel said it’s believed the fire originated near the hot tub at the home on Detroit Street. The hot tub was next to the garage, which went up in flames, Vogel said. Ann Arbor firefighters went through a neighbor’s backyard facing East Kinglsey Street in order to suppress the fire, Vogel said. The fire was extinguished within minutes. 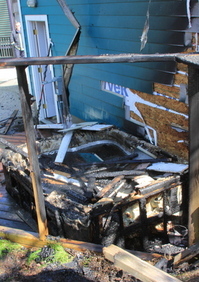 No one was injured in the fire and Vogel estimated the damage to the garage, fence and hot tub at about $10,000. Inspectors were responding to the home to continue the investigation into the fire Monday afternoon, Vogel said. Tue, Apr 3, 2012 : 12:20 p.m. I don't see the swing of the door being overly problematic. It would have made more sense to swing towards the interior sure, but as it stands all it means is that if the door is open wider than 90 degrees the garage door won't close because the safety sensor would have been tripped by the door. Tue, Apr 3, 2012 : 2:25 a.m.
Nice catch Little voice, I was to busy thinking about the big payback. For those of you that don't follow, look closely, the door opens into the vertical path of the garage door. It should have been hung to swing the other way. And please, that last comment is in no way meant to be offensive to the fact this is a house in Kerrytown neighborhood. Tue, Apr 3, 2012 : 12:40 a.m.
Looks like we found out where the hot tub on top of the U of M building ended up. Mon, Apr 2, 2012 : 11:36 p.m.
Mon, Apr 2, 2012 : 11:22 p.m.
To be fair it appears that door location is the only one that would work if a hot tub was desired on the side of the house. The bigger question here is likely who did the electrical work on the hot tub not who installed the door. Mon, Apr 2, 2012 : 10:27 p.m.
Mon, Apr 2, 2012 : 9:53 p.m.
...More accurately, the construction on the home, the garage and everything else was just finished 5 months ago! If anything, this unfortunate event speaks volumes about the builder!!! Just LOOK at how the side door to the garage COLLIDES with opening and closing the main garage door! That kind of shoddy craftsmanship these builders get away with nowadays, could cost people their lives!! Fortunately, the fire was quickly contained and didn't spread to the other homes and buildings that are in REALLY CLOSE proximity! Ann Arbor Building Dept., where are you?? OR, here's a thought, could the door have possibly been kicked in by firefighters, thus damaging the door stop that kept it from COLLIDING with the garage door? Scandalous. Tue, Apr 3, 2012 : 12:24 p.m. I'll add that the story says the hot tube was newly installed. and the side door issue merely precludes the garage door from closing when the side door is open wide enough to impact the safety sensor. Hardly a life threatening issue. Tue, Apr 3, 2012 : 3:16 a.m. The builder might have been followinig an architect's plans. Mon, Apr 2, 2012 : 7:02 p.m.
Mon, Apr 2, 2012 : 11:23 p.m.
Mon, Apr 2, 2012 : 7:35 p.m.
Mon, Apr 2, 2012 : 7:33 p.m.
the next thing I wonder is who did the wiring for the hot tube?